Shropshire are still in with an outside chance of claiming the Minor Counties Championship Western Division title despite being held to a third straight draw by Dorset in Bournemouth. Having been 81 runs behind on first innings at Dean Park, Shropshire almost ended up winning in an exciting finish. 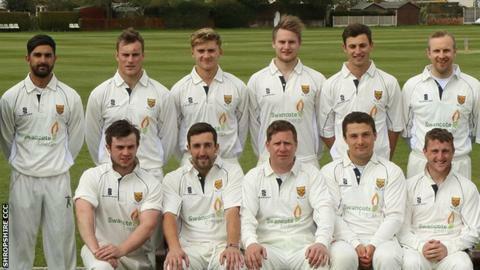 Resuming on 48-1 on the final day, Shropshire were dismissed for 295 for the second time in the match. But skipper James Ralph took 5-55 as Dorset, on 188-8, were left hanging on. That followed the five-wicket haul the Shropshire captain had also taken in their previous game, the draw with Berkshire at Newbury. Leg spinner Ralph had earlier top scored with 71 as Shropshire set Dorset 215 to win. The hosts had appeared to be cruising at 85 without loss but Ralph then took five of the next seven wickets, as well as being responsible for a run-out. Going into their final two fixtures against strugglers Wales and Devon, Shropshire still stand in fourth place in the Western Division table, now 19 points behind leaders Cornwall. Ralph's side suffered a sluggish start to 2015, losing all four 50-over Knockout Trophy qualifying group games before exiting the inaugural Minor Counties Twenty20 competition at the first hurdle. But they bounced back from that to win their opening Championship game inside two days against Cheshire at Whitchurch before then drawing with neighbours Herefordshire at Eastnor, followed by the draws with both Berkshire and Dorset.